Jean Laurenz is an eclectic musician who loves variety and collaboration. As a performer, Jean has enjoyed appearances with Adele, The Hanson Brothers, The Boston Pops, and the Hong Kong Philharmonic. Her favorite genre is chamber music and she frequents this arena with innovative ensembles including Seraph Brass, The Knights, A Far Cry, Alarm Will Sound, and with Carnegie Hall’s resident fellow chamber group, Ensemble Connect. Jean is also a vocalist and stage performer who enjoys multi-dimensional artistic performances which combine theater, singing, trumpet, and visual arts. She will appear with the Knights in the theatrical production of “The Head and The Load,” and has toured Europe with Lucerne Festival’s dance and theatrical production, Divamania. As a vocalist, she has performed the national anthem and other musical services at most major Chicagoland sporting arenas, including performances with the Chicago Cubs, Chicago White Sox, and the Chicago Fire. 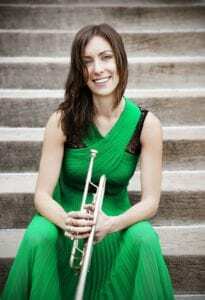 Jean holds degrees in trumpet performance and choral education from Yale University and Northwestern University. She is a passionate educator, social activist, and teaching artist. Her work with Handel and Haydn Society and Carnegie Hall has connected her to public school students in Boston and the Bronx who have helped shape her artistic perspective. Jean has curated children’s shows for both Carnegie Hall and the Boston Symphony and she is a current fellow with META (Music Educators and Teaching Artist). When she is not performing or teaching, she shares her passion as a youth coach at her local climbing gym.